We arrived in Cape Town, our last stop on the Baz Bus route, late on a rainy Tuesday night. After three weeks using the Baz Bus, it was time to get our own set of wheels and explore a little of the area surrounding central Cape Town. After researching the cheapest way to get a car, we ended up booking through Around About Cars. Of course we booked the cheapest possible option. Upon arriving at Around About Cars and seeing what we would be spending the next week driving in, I pulled Bret aside and asked whether or not we should consider upgrading. 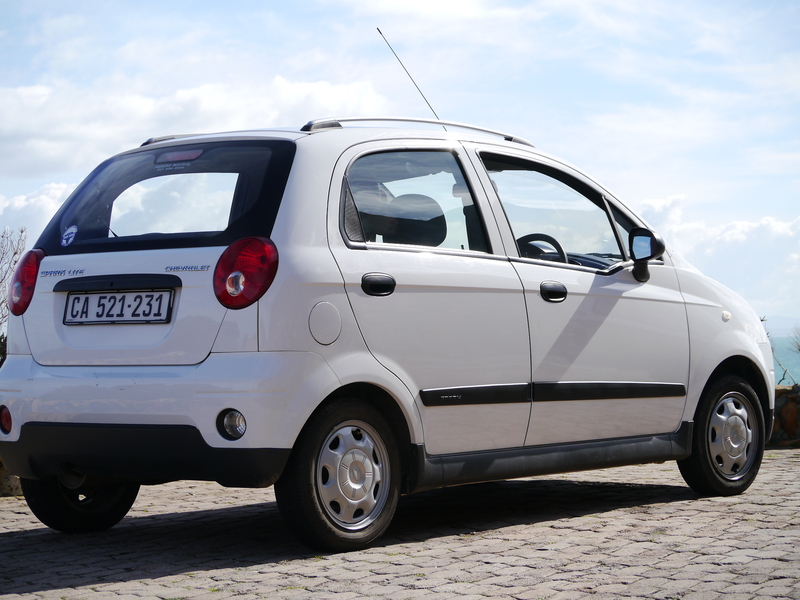 We had booked a Chevy Spark Lite. The wheels looked like the wheels on a child’s tricycle! Bret assured me it would do the trick and with a little resistance we proceeded with the rental process. It wasn’t long before we were off on our Western Cape adventure. It had been almost six months since I had been behind the wheel of a car and several years since I had driven on the left hand side of the road but I had no doubt that I would be able to get us around safely (despite the Spark Lite). As soon as we pulled away Bret was trying to direct me, telling me to change gear, look this way, don’t go yet, look that way. After a few kind words reminding Bret that I grew up driving a manual on the left had side of the road and that he had never driven that way I convinced him that “I got this” and we settled into our road trip. First stop, Stellenbosch. Stellenbosch is roughly an hours drive from Cape Town. The second oldest European settlement in South Africa and a university town, it is well-known for its numerous wineries. We booked three nights here allowing ourselves two full days, one for visiting the wineries and another to check ou the town itself. Upon check-in at our hostel we were given the run-down on our wine tour options. A six-hour long group tour of four wineries, the Vine Hopper hop-on-hop-off bus that visited six different wineries and allowing you to visit each at your own pace or DIY. Seeing as I was the only one driving, DIY was out of the question. We opted for the Vine Hopper bus and signed up for the next day. We were extremely lucky to have perfect weather for our day of wine tasting. The driver of the shuttle, Husein picked us up from our hostel at 9am (sounds early but we wanted to ensure we had enough time to visit all six of the wineries before the last bus at 5pm). The first winery was only a ten minute drive away, needless to say, we were their first customer for the day. It cost us about two dollars for five tastings of our choice. I had that freshly brushed teeth taste in my mouth so it wasn’t until the third tasting I was able to appreciate the wine. After 45 minutes or so tasting and checking out the wineries amazing garden we were happily on our way with a lovely bottle of rose and only ten US dollars out-of-pocket. Next up was the international award-winning Van Ryn Brandy estate. Seeing as Bret and I were the only ones on the bus that day, Husein made sure we were there in time for a 10am tour of the premises. We were cheerfully greeted by one of the staff members with a brandy cocktail made with their 5-year mixed, with mango and apricot juices. We spent about 45 minutes learning the process in which Brandy is made and also had a demonstration of how the barrels were made back in the day before machines took over. After the informative tour it was time for the tasting. They had a few options and we chose the one with the brandy chocolate pairings. 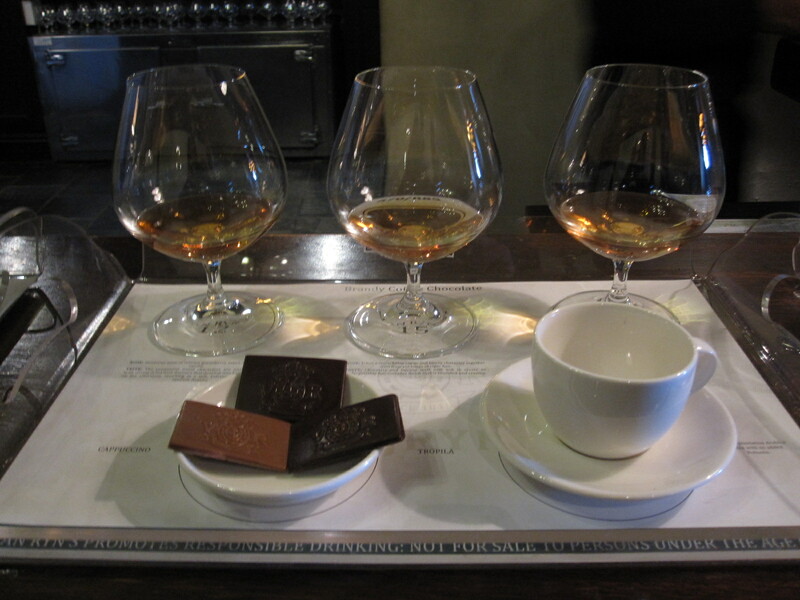 We were able to try their ten-year, fifteen year and twenty year brandys. It was a little much for me to take in before 11am but I powered through and Bret officially declared himself a brandy drinker. We continued our tour with Husein onto one of the more well-known and commercial wineries in the area, Spier. We enjoyed their gardens for a while before sampling a selection of their wines. 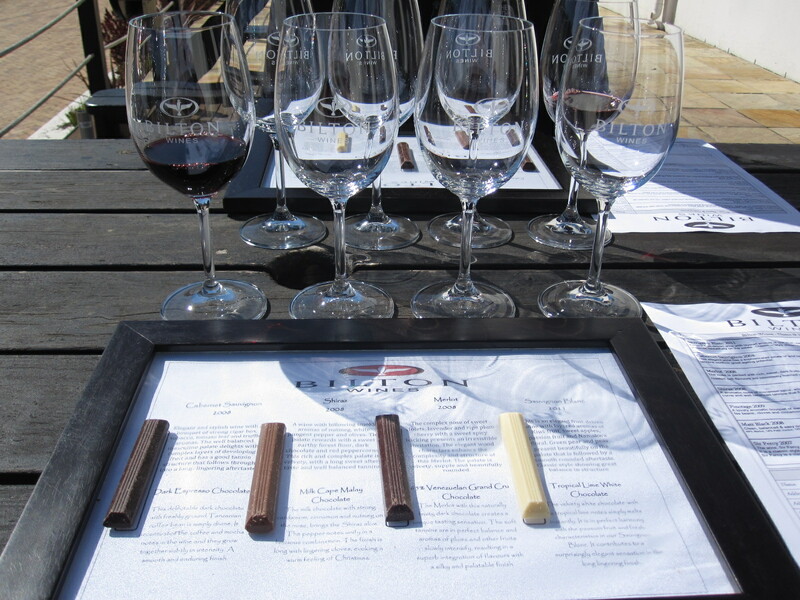 Next up was yet another lovely estate where we enjoyed wine and chocolate parings – now this is what I’m talking about! Five wines paired with chocolate and two without. By this point Bret and I decided we needed to get some food in our bellies! We would later find out that a salad each was not such a smart decision. Our second-to-last winery we struck up conversation with a few Capetonians who were enjoying a day off work. By the looks of it, they had been wine-hopping for a while like us. We hung out for an hour or so and were having a great time but we still had one more winery to visit and we didn’t want to miss out on anything! Kenny, Sheldon and his crew decided they would follow our van to the last stop. Their designated driver said she would give us a ride home so we thanked Husein and off he went. We grabbed a table outside to enjoy the sunset. I went with the wine tasting while Bret decided on a bottle of red to himself. Needless to say, the evening began to get a little hazy. All those small pours add up over the day, especially having only a measly salad to soak it all up. By the end of our winery adventure we made it home safely with our new friends and were crashed out before 8pm! The next day was off to a rough start but we dragged our butts out of bed to take a walk around the quaint town of Stellenbosch and enjoy the sunshine. NZ were also playing Australia in the Rugby Championship so we stopped off at a local pub to catch the second half – Kiwis won! The next stop was Hermanus. A fairly large-sized town considered to have the best land-based whale watching in the world. We were told the drive from Stellenbosch would take around five hours. We took the scenic whale route along the side of the cliffs hanging over the Indian Ocean and were pleasantly surprised to arrive at our destination less than two hours later. We had only booked on night here and spent our time walking along the cliff paths taking in the stunning scenery and looking out for whales. We did spot a few roughly 50 or so meters off shore but none of them did anything exciting. 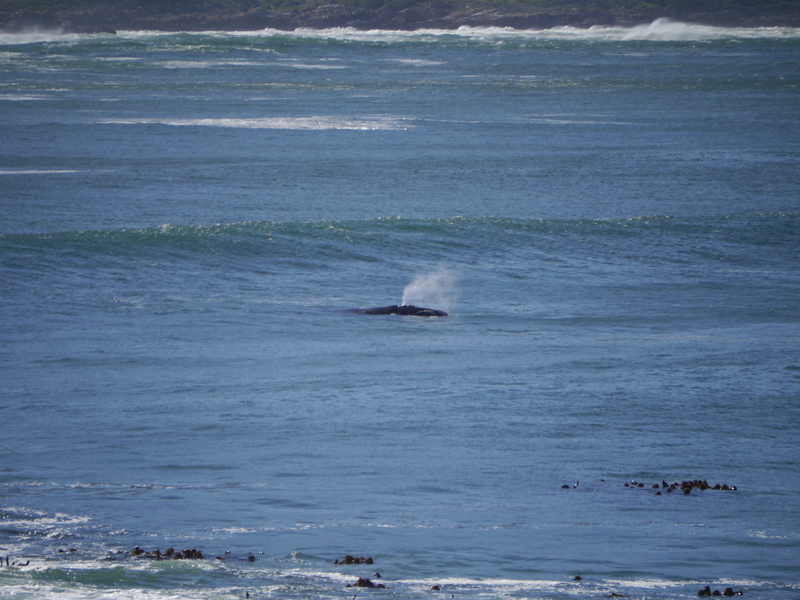 In fact, the best view of a whale had been at Mossel Bay. We could have taken a boat trip out to see the whales but seeing as we are trying to make our travel fund last another 12 months, we decided against it. Despite being slightly disappointed with our whale viewing, we enjoyed our short time in Hermanus. Making our way back towards Cape Town we headed on over to Simon’s Town, another stunning drive following the coast for most of the way. We had booked two nights here but upon check in we were told that they only had room for one night. There was a sailing race going on so unfortunately moving to another hostel was out of the question as everything was chockers. Seeing as we were limited on time we headed straight to Table Mountain National Park. Neither of us realized how huge the park was and were bummed to find out that the park closed it’s gates at 6pm and we only had two hours to look around. 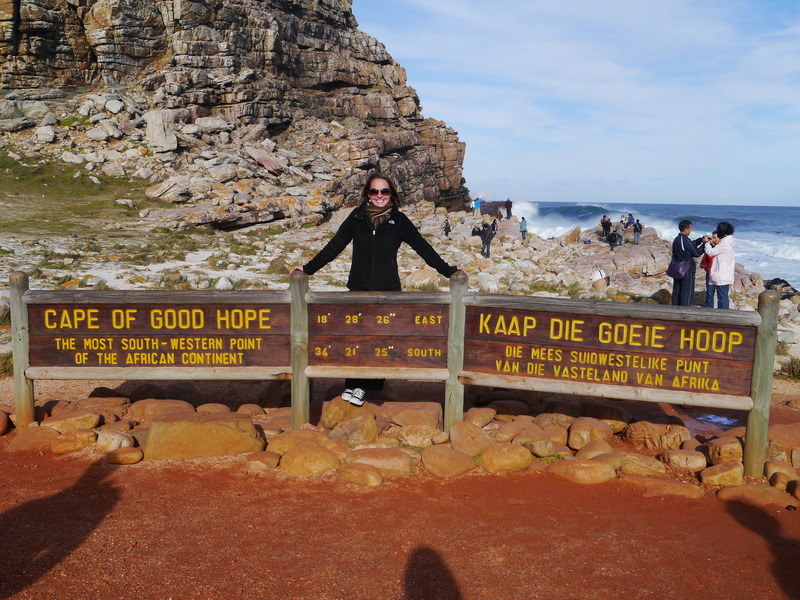 We headed straight to the main attraction; a short walk up to Cape Point and to the Cape of Good Hope. The views at both locations were amazing. We wish we had more time to spend there but we had to make our way out before the gates closed for the night. Next time I guess. 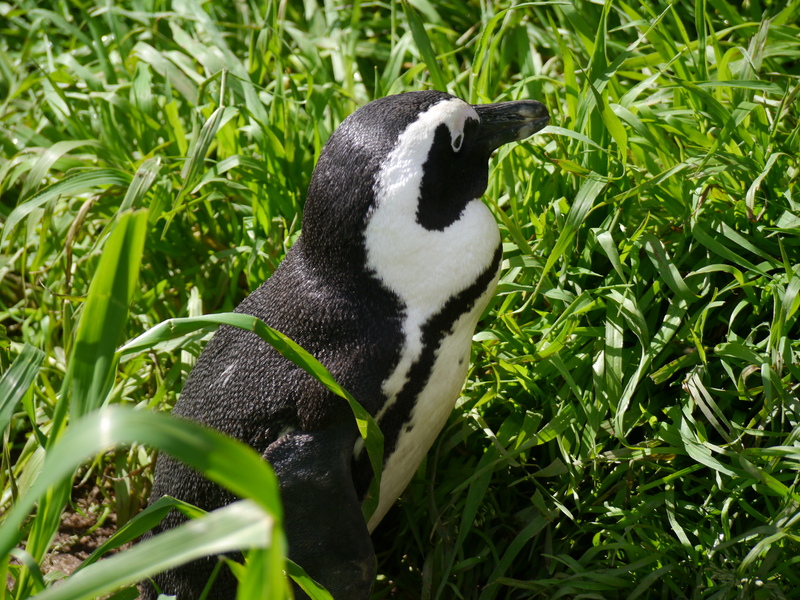 After checking out of Simon’s Town Backpackers we headed down the road to take a look at the African Penguins. They have set up these wooden walkways set up at Boulders Beach that take you right through the area where these little guys hang out. It was pretty cool to see the penguins in a beach environment when Bret and I both always think of penguins living in cold, icy climates. With no accommodation available for our second night in the area, we moved on closer to Cape Town, stopping in Hout Bay. We drove the M6 route that took us along the breathtaking Chapman’s Peak Drive. The weather was pretty terrible while we were in Hout Bay but we did manage to get out a little since we had the car. We stopped in at Original Tea Bag Designs, a business created by an English woman who moved to South Africa some time ago after her husband had a job transfer. She was appalled by the poverty in the area and wanted to do something to help people in the local community. After a suggestion from one of her friends she created Original Tea Bag designs that sells local art created with used tea bags. You can check out a great clip telling her story here. Many people we had met on the road since arriving in South Africa had told us that we should save at least a week to spend in Cape Town. So after Hout Bay we made our way back to central Cape Town where we would spend our last ten days in South Africa.